John Doyle has 111 previous convictions. A MAN ARRESTED following the looting of a Centra during Storm Emma last year threw trollies in the path of gardaí as they pursued him through the shop, a court has heard. John Doyle (38), who has 111 previous convictions, had only been in the shop for one minute and 30 seconds before gardaí arrived and was found with three packets of cigarettes. Doyle, of Russell Drive, Russell Square, pleaded guilty at Dublin Circuit Criminal Court to trespassing at Centra, Kiltalown, Tallaght on 2 March 2018 with the intention of committing theft. Judge Melanie Greally adjourned sentencing until July to allow a probation report to be prepared. Detective Garda David Jennings told Eoghan Cole BL, prosecuting, that gardai received a call shortly before 8pm during the “atrocious” weather conditions of Storm Emma that the security door of a Centra shop had been breached with a mechanical saw by a group of people. Gardaí made their way as far as they could in a jeep and the remainder of the way on foot. As they arrived, a large group of people on the road began shouting warnings that gardaí were coming. Detective Garda Jennings said the front shutter of the store had been cut open and people were coming out. Officers entered the shop and Doyle took off towards the back of the premises, throwing trollies to obstruct them. He was found crouched down trying to hide in the store room. Two other men were found in that area of the shop, one of whom had a sledgehammer. Doyle’s previous convictions include offences such as robbery, burglary, possession of stolen property, road traffic offences and criminal damage. A co-accused, David Berney (37), of Suncroft Park, Tallaght, has already received an 18 month suspended sentence for his role in the incident. Detective Garda Jennings agreed with Sarah Jane O’Callaghan BL, defending, that 12 or 13 people could be seen coming in and out of the store on infrared CCTV footage and Doyle was identified by “work boots” he could be seen wearing. He said the majority of the damage had already been done by the time Doyle entered the shop. Detective Garda Jennings agreed Doyle was not present when the shop shutters were cut open with a con saw and that the cigarette machine had been forced open before he arrived. Ms O’Callaghan said that certain people looked out of the shop and appeared to beckon others over and it was at that point that Doyle entered the store. She said Doyle had panicked on seeing gardaí and ran, throwing trolleys to slow them down. She said he was deeply ashamed of his actions which almost cost him his relationship with his partner. She said he did not cause the criminal damage in the area of the shop where he was found. Counsel said that Doyle had a significant past but is a deeply committed father who had got his life together. She said he was disgusted that he was lured into chaos and lawlessness on the night. She said he had drink taken on the night and it had been an “opportunistic and stupid” thing to do. Email “Man arrested over Centra looting during Storm Emma pushed trollies at gardaí as he tried to escape, court hears”. 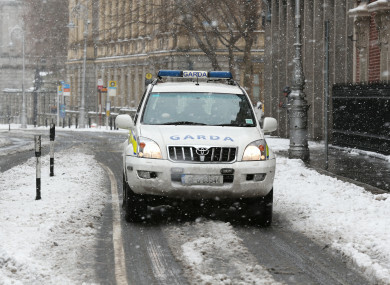 Feedback on “Man arrested over Centra looting during Storm Emma pushed trollies at gardaí as he tried to escape, court hears”.